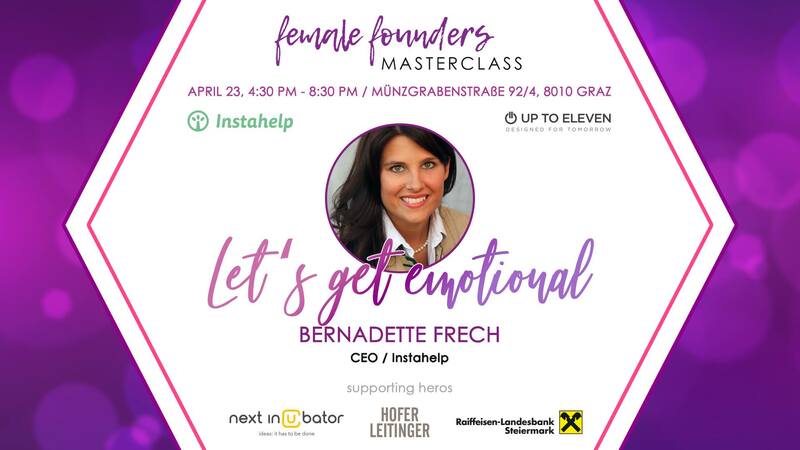 We are cordially inviting you to our Masterclass South with Bernadette Frech, CEO of Instahelp! The driving force of any behaviour are emotions – so we better understand them! Our Masterclass is about your emotions and the emotions of your customers. Do you want to fundamentally explore your own emotions? Should you show or hide your emotions in business? Have you ever questioned what your customer is really feeling when buying your product and how you can manage those emotions? Don’t be afraid to feel the answers to all these questions, rather be passionate! Bernadette is CEO of Instahelp, the mental health platform offering psychological counselling online in five European markets. Her PhD was concerned with consumer emotions. Besides, she is senior lecturer at FH JOANNEUM, Karl Franzens University and Aston Business School UK and strategic head of the Global Entrepreneurship Monitor team Austria. Curious to learn more about emotions and how to handle them? The Masterclass is for free and limited to 10 startup-teams. The Masterclass of the Female Founders South community provides female entrepreneurs the opportunity to improve their business in small-sized working groups. Top startup-experts will support you with your startup idea and teach you everything you need to know for fostering your business. We love startups. We understand women. We haven’t found an event like this yet. That’s why we decided to do it the startup way: stop complaining, start doing. With this event, we want to bring women and startups closer together and provide a place to connect and have a good time. Our big aim: Fostering female entrepreneurship. This event is hosted by The Female Founders Club South, a non-profit project by Julia Plakolm, Martina Hölzl and Stefanie Horvath. By starting this initiative, we want to connect like-minded women that are willing to conquer the world.